While fire is widely known to cause significant levels of property damage, not as many people are aware of the harm that excess smoke and soot can result in. These elements can continue to cause damage long after the initial event. They are also capable of causing problems during controlled events, such as fireplace fires or the lighting of candles. At Rainbow International Restoration of South & West Suburbs, we address all smoke and/or soot damage through our smoke and soot removal services in Orland Park, IL. We also restore areas affected by similarly corrosive elements, and lingering odors. The technicians of Rainbow International Restoration of South & West Suburbs are highly trained and equipped to provide effective cleanup of smoke and soot and they have each gone through a background check for your safety and security. While smoke and soot are not typically associated with permanent damage, they should be. Both have the ability to spread throughout your building and harm materials with their acidic and corrosive properties. They can cause etching and discoloration and leave behind unpleasant odors. In many cases, affected materials can become permanently damaged within 72 hours if they are not properly treated. When smoke and soot threaten your building and its contents, we encourage you to take advantage of our smoke and soot removal services. As a leading disaster restoration and cleaning services provider, we respond to a variety of property-damaging events. This includes devastating fires on both large and small scales. We make use of appropriate cleaning solutions and restoration methodologies to effectively repair damaged areas and items. Smoke is notorious for leaving behind unpleasant odors when it is allowed to sit for a period of time. This is because it gets absorbed by porous materials, such as wood, drywall, fabrics, and more. By utilizing advanced deodorization technologies and methodologies, we can extract these odors, and prevent them from returning in the future. By tackling odors at the source, we ensure that you are not left with any surprises once we finish our work. We remain available 24/7 in order to respond to emergencies in a timely manner. Because of the speed with which permanent damage can take place, this is critically important. 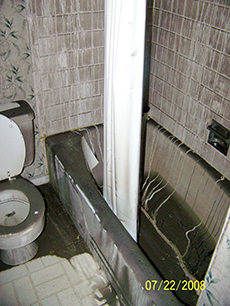 It gives your building and belongings the greatest odds of being fully salvaged and sanitized. In situations involving soot or smoke damage, you may be unsure if you should file a claim with your insurance provider. Our technicians can advise you on the best course of action regarding your claim once we have fully assessed the damage. We also provide direct billing to bill your insurance carrier if you do file a claim. If you have any questions or concerns about our smoke and soot removal services, or would like to utilize our emergency-response capabilities, we encourage you to contact our representatives at (708) 571-2550. Our technicians will provide fast and effective services and we also offer a price match guarantee to keep your costs low. We will meet or beat competitive proposals that are in line with the IICRC’s standard of care. At Rainbow International Restoration of South & West Suburbs, we understand that disasters can occur at any time of day. We remain available 24 hours a day, 7 days a week, to provide emergency services in Orland Park, IL.